Preheat oven to 350°F. Butter 13x9x2-inch metal baking pan. Using electric mixer, beat flour, coconut, powdered sugar, and 1/2 teaspoon salt in large bowl until well blended, 30 seconds. Add butter; beat on low speed until moist clumps form. Press dough onto bottom and 1/2 inch up sides of pan. Bake crust until golden (edges will be darker), about 25 minutes. Meanwhile, place sugar and lemongrass in processor; pulse until lemongrass is finely ground, about 1 minute. Add lemon juice; process until well blended, about 30 seconds. Add eggs; process to blend, 10 to 15 seconds. Add flour and pinch of salt; pulse until smooth. Reduce oven temperature to 325°F. Pour filling over hot crust; bake until filling is firm, 22 to 23 minutes. Cool in pan on rack. Cut lemongrass bars lengthwise into 4 strips, then crosswise into 6 pieces. 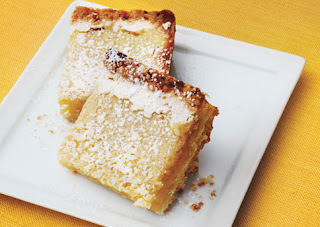 Dust bars with powdered sugar and serve.